This year, Tu B’Shevat, the Jewish New Year for The Trees, is on February 3, 2007. Signaling the onset of spring in Israel, it is a day of joy, rebirth, and of new plantings. This year, in northern Israel, it means something more as the area forests creep out from under the debris of burnt woods following the summer’s war with Hezbollah. Below is an update of the status and renewal strategy for the region’s woodlands. We hope you will use this timely piece and/or contact us for further information. January 3, 2007 -- New York, NY -- It is estimated that Hezbollah fired about 4,000 Katyusha rockets at northern Israel last summer causing havoc, trauma, loss of life, and untold damage to homes and businesses. Residents of northern towns breathed sighs of relief when the rockets fell outside city limits, but those rockets -- an estimated 400 -- caused damage of a different kind: more than 10,000 acres of forests, woodlands, reserves, and agricultural lands were destroyed by rocket fires during the 33-day war. Israel was not blessed with natural forests. While northern Israel, called the “green lung of the country,” is covered with trees, they were all hand-planted 2-3 generations ago by the pioneers of the State. It took 50 years for these forests to mature; it will take another 50 years to regain what was lost. The pioneers who founded the State planted trees to lay claim to the land they had re-purchased. Owning land is one thing; caring for it is another. 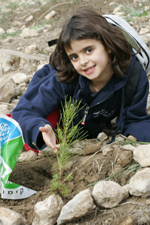 More than 240 million trees have been planted through JNF since it was founded in 1901, and it bound both young and old to the soil of their homeland. Jewish National Fund (JNF) foresters -- some 2nd generation foresters whose fathers and grandfathers planted those very trees --actually stood in the forests waiting for the next rocket to fall so they could douse them as fast as possible. Unsung heroes, they risked their lives, claiming “each tree was like a baby to them.” Many had been with JNF for over 20 years. Saving those trees was like saving their own family. The impact of the devastation is myriad and far-reaching. 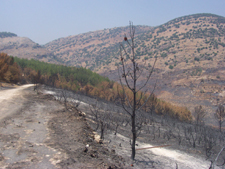 Aside from destroying trees, the fires also degraded the soil quality which took 50 years to develop. Much of the nutrient-rich topsoil was burnt away, and, in some areas, the soil was baked into a hard outer crust preventing the infiltration of rainwater and increasing the chances for soil erosion, floods, and mudslides. Additional soil loss is expected, mainly during the first year, until herbaceous cover develops. Destruction of the forests also altered the food chain and destroyed the habitat of forest-dwelling wildlife. Nesting and roosting sites, forage and food sources, dens and lairs have all been decimated. While some larger animals managed to escape the fires, most slow-moving animals, reptiles and insects were killed. The habitat must be restored in order to facilitate nature’s healing process. Tourism, the lifeblood of the north, slumped by 25% during the war. JNF forests are a main tourist attraction and boost the local economy with the traffic they bring in. For tourism to thrive, the forests must be restored. There is also increased risk of invasive plant species overtaking areas, and the possible depletion of the seed bank and regeneration potential within the area. 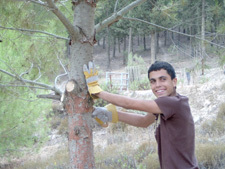 JNF’s Forest Department, together with the Israel Nature and Parks Authority, the Ministry of Environmental Defense, and the Ministry of Agriculture, has turned the disaster into an opportunity and challenge to implement the principles of sustainable development and sustainable forest management as it seeks to re-green the north. The multi-faceted plan -- defined by ecological, social, economic, and intergenerational principles so as to answer all needs of a society -- includes working with natural systems and the enhancement of biological diversity as a central guideline; preserving the size and quality of the current forest inventory for future generations; advancing the economic use of the forest for tourism, wood production, pasture etc; and keeping access open and free for all to use. 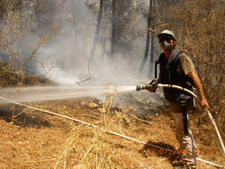 As the plan proceeds, a research program entitled “Rehabilitation of Mediterranean Ecosystems in Northern Israel Following Missile-Ignited Wildfires” will be conducted and shared with the world. 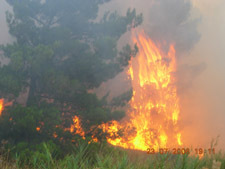 While there is public pressure to replant the burned areas as soon as possible and more than 20,000 volunteers -- about 200-400 a day, from students to industry executives alike -- have already gotten their hands dirty clearing away the debris, concern for soil loss and a respect for natural regeneration is paramount. According to Paul Ginsberg, director of the Forest Department in JNF’s Northern Region, “much of the forest area in Biriya has steep slopes. It is important to make sure that soil erosion is not sped up by logging too many trees at once. So we are leaving a lot of the burnt trees and will wait to see if they reseed and what natural vegetation occurs. Each year will bring with it additional clearing and replanting. It is estimated that the initial replanting process will take five years and about $40 million; it will take 50 years for the forests to be as they were. 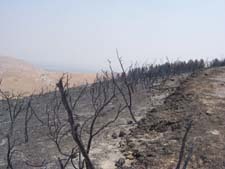 The process will also include the maintenance of firebreaks -- geographical gaps within forests that block the progress of fires -- and salvage cutting which decreases density and vermin, helps control forest fires, and rids the forest of unhealthy trees that have less reserve and are unable to fight off parasites and disease. 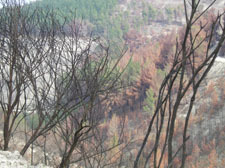 When and where replanting occurs, some of the non-indigenous pines -- brought over by the Eastern Europeans from the Black Forest as they grew quickly -- will be replaced by a mixed conifer/native hardwood forest for ecological reasons: they are more stable, allow for a greater level of biological diversity of the forest inventory and a higher degree of resistance to fire and disease. They include the native oaks, carob, redbud, almond, pear, hawthorn, and the exotic Atlantic cedar, cypresses, stone pine, brutia pine and canary island pine. Burnt stands of brutia pine, more resilient than the Jerusalem pine -- which was planted because it is native to Israel and an adaptable species able to grow in the moist, cool north as well as the dry south in a wide variety of soil types but susceptible to disease -- will be allowed to reseed themselves and where deemed necessary, additional broadleaves will be planted to diversify the mix. Some of the trees will be fruit- or berry-bearing. This will create more mast and nesting opportunities for wildlife as well as chances for the visiting public to enjoy these fruits, which would include various bird species, wild boar, gazelles, rock rabbits, foxes, tortoises and various reptiles. In response to the war in northern Israel, JNF launched Operation Northern Renewal, a 10-year, $400 million campaign to rebuild and renew northern Israel and make it home again for its residents. Reforestation is one part of the campaign. 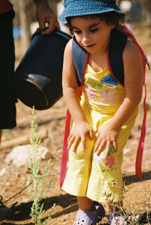 Other aspects include upgrading parks and recreation sites; developing tourism; preparing land for agriculture and providing research and development; working on preparedness (more fire trucks, accessible hydrants and equipment storage); the purchase of a firefighting airplane; year-round camps for children; a housing loan program to encourage families to move to the north; funding of Hugey Sayarut, Israel’s elite youth movement; and volunteer activities. For more information, go to http://support.jnf.org/. To contact your local office, please call 888-JNF-0099 or visit support.jnf.org.To contact your local office, please call 888-JNF-0099 or visit support.jnf.org. Trees improve air quality by filtering dust and other particles and removing pollutants from the atmosphere. Through photosynthesis, trees remove carbon dioxide (the primary greenhouse gas), nitrogen oxides, airborne ammonia, sulfur dioxide, ozone and other pollutants from the atmosphere, giving off oxygen in the process. Trees control the climate by moderating the effects of sun and wind. Energy from the sun is absorbed or deflected by leaves and filtered by branches. Trees also act as windbreaks, changing the direction and speed of winds. Trees prevent soil erosion, flooding, and landslides. Roots hold soil in place, increase soil permeability, and absorb water, reducing runoff and flooding after rainstorms. Trees provide food and a safe habitat for wildlife. Trees lower energy costs and consumption by cooling buildings in the summer and protecting against strong winds in the winter. A building that is surrounded by trees requires less air conditioning during the hot months and less heat during the cold months. Trees act as sound barriers, helping to muffle urban noise. Trees beautify their surroundings and provide peace and tranquility. Studies have shown that patients recover more quickly from surgery when their hospital rooms afford a view of trees. Captions: The pictures used in this release were taken during and after the war with Hezbollah. All are availabe as high resolution jpegs upon request.